Michael Days is an executive VP and editor of the Philadelphia Daily News. Since joining the paper 25 years ago he has served as managing editor, deputy managing editor, and was named editor in 2005. Under his leadership the paper has won numerous awards, including the Pulitzer Prize for investigative reporting in 2010. Days earned a master’s degree from the University of Missouri, School of Journalism. He is a McCormick Fellow and graduate of the Media Management Center’s Advanced Executive Program at Northwestern University. 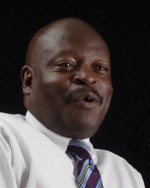 He served on the APME national board and is editor of its quarterly magazine, APME NEWS.